NOTE: DUE TO THE LOW PRICE FOR THIS ITEM, RETURNS WILL NOT BE ACCEPTED. 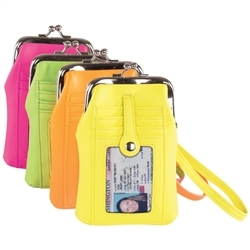 This colorful wristlet is just the perfect thing to take with you on the go. No need to lug around your heavy purse; simply toss your money, credit cards and license inside - and go! Measures 5 1/2" tall x 3 3/4" wide. (Can also be used as a phone case, but be sure to measure your phone, because some, like I-Phone 5 with hard case, or Samsung Galaxy, are too large to fit inside wristlet). Bright colors make this necessity a fashion statement! Select bright green, bright orange, hot pink or bright yellow.